Engage Call Center Employees to Achieve Results! Call centers are often subject to high turnover and absenteeism and low employee engagement. Companies in the call center can turn to a call center program such as peer to peer recognition, customer service and attendance awards to combat these problems. Awards Network’s flexible online incentive programs allow each client to tailor the call center program to specific organizational objectives. With Awards Network’s reporting capabilities, organizations are able to determine the progress of an incentive program anytime, anywhere. 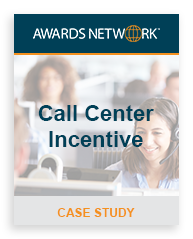 A client approached Awards Network to assist in rewarding, engaging and recognizing their call center employees with incentives. Awards Network designed a call center program that allowed employees to access the program website with a unique username and password. Each user’s account contained baseline targets that need to be attained to earn award points. Each time points were awarded, employees were automatically notified by email. With 15 different categories/point levels of lifestyle merchandise, each employee qualified for the lowest level, provided he or she did not have an unexcused absence for the first 2 months. After the kickoff period, emphasis was heavily placed on monthly sales goals and customer satisfaction ratings. Finally, after 6 months of the call center program, employees were then able to earn points for improving their processing times. Since the incentive program goals were introduced over a 6 month period, emphasis was equally placed on the organization’s various objectives. Throughout the call center program, employees were able to nominate co-workers for different reasons as part of the incentive program’s peer to peer recognition component. Are you ready to engage and recognize your call center employees? Contact Awards Network today to discuss your call center program needs.